How Sweep It Is (Couldn't Think of Anything Better) ~ The Bucky Channel - The World of Sports from Wisconsin's Perspective. When you have the second best record in the National League, it would almost be unacceptable to lose any one of four games to the team with the worst record. Especially at home. That's why everyone at Miller Park was smiling today, as the Brewers were able to complete the four game series sweep against the Washington Nationals with a 7-1 victory. Dave Bush threw from the hill Monday afternoon, and gave up his only run of the game right away in the first inning. After that, Bush threw some pretty good stuff, going 6 1/3, striking out 6. In relief was Bush was David Riske, Seth McClung, and Brian Shouse, the latter being able to work out of a bases loaded, no outs jam in the 7th inning. It was a good day on the mound, but could the Brewers bring the support with their bats? Well, since I already told you they won 7-1, the answer is yes. Rickie Weeks tied the game with a solo shot in the 1st, and Corey Hart took the lead with a 2 run shot in the 4th. 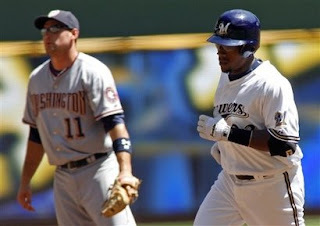 Fielder, Counsell, and Hall added RBI's from there, and the Brewers coasted to their 6th straight victory. It's hard not to love this Brewers team right now, even though some of us (me) were greatly concerned about them a couple of weeks ago. As I alluded to yesterday, I was able to make it to the game Monday, which is a big deal for me since I live three hours away. I dream of the days when I may one day be able to purchase a 9-pack, a 20-pack, or (gasp) season tickets. But for now, I have to find every opportunity to go to a game that I can. Just a couple notes about the game today. How did I see more Cubs jerseys than Nationals jerseys? Now that I think about it, I didn't see any Nationals gear, at all. I saw a Royals hat, a Cardinals shirt, and even a Brett Favre Jets jersey, but nothing with the Nationals insignia on it. Also, I bought tickets in the 300 level for the first time, which was different. These are the seats that are on the same level of the box seats. It's a pretty nice area, and you have to enter through doors and show your ticket to get there. It's really not anything special, although the simple fact that you have to show your ticket makes it feel that much more luxurious. Also, there is a like a cocktail bar in there, they sell more variety of food, and the bathroom lines are incredibly short. That, and when you buy a sausage, they give you a pickle with it! That was by far the best part of the whole day. Besides the Brewers win, of course. TBC's Player of the Game: Corey Hart (half for the home run, half because I bought his NL All-Star shirt on sale).